The figures come in the standard Master Box Ltd figure type box, with a colour drawing of the contents on the front and a build and break down of parts on the reverse. The 5 multi-part figures come in the normal format across two trees of parts. Each figure being made up of separate head, arms, upper torso, legs, coat and jacket parts. All are standing figures. All come with individual equipment. 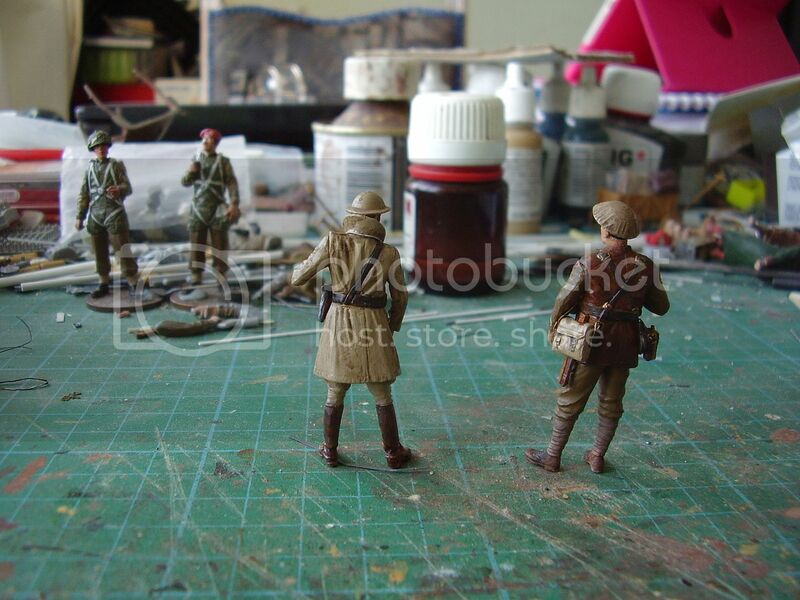 The figures stand approx 43mm from heel to shoulder. 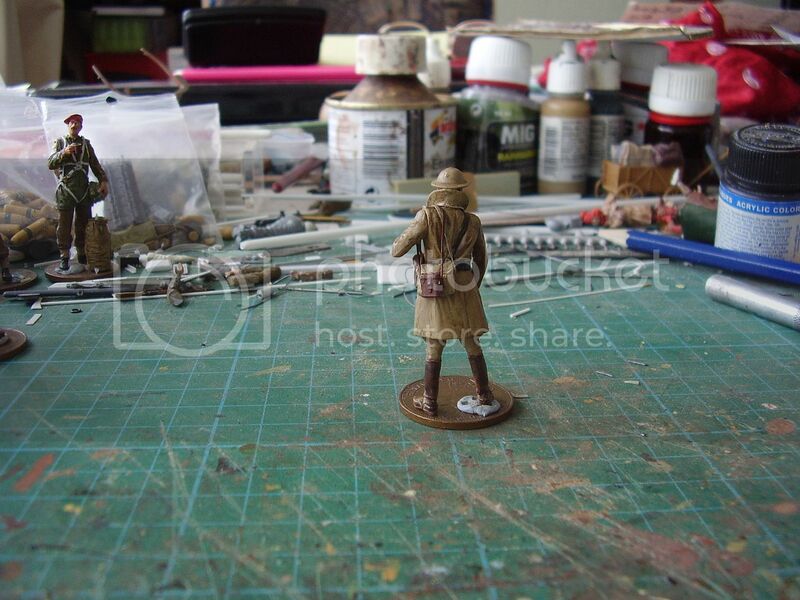 The Officer is depicted in a trench coat and helmet, with pistol holster and ammo pouch on a Sam Brown belt and a haversack slung over his right shoulder. The cross strap for the Sam Brown is not included on the mould. 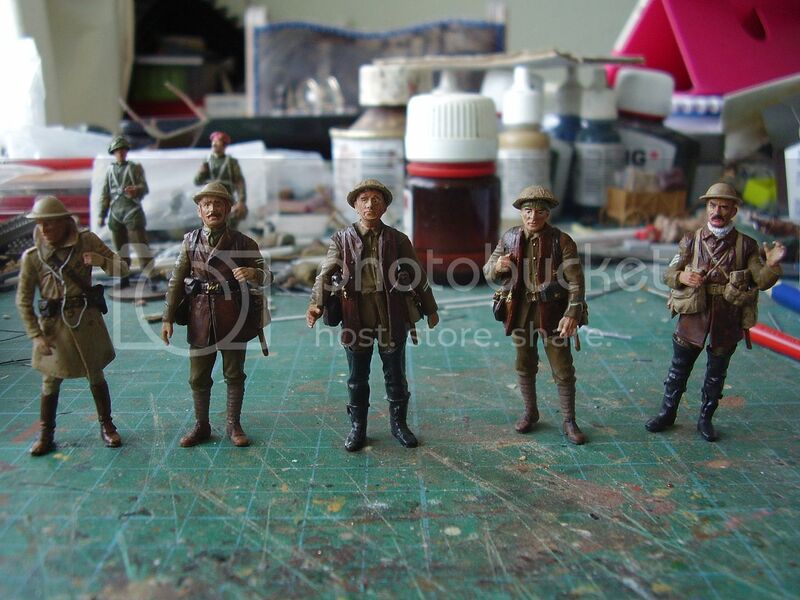 Of the 4 infantrymen 3 are depicted with the 1914 leather equipment and 1 with 1908 web equipment. Each soldier wears a British Warm (leather jacket) and 1 of the infantrymen in the 1914 leather equipment is depicted as a Lewis Gunner. 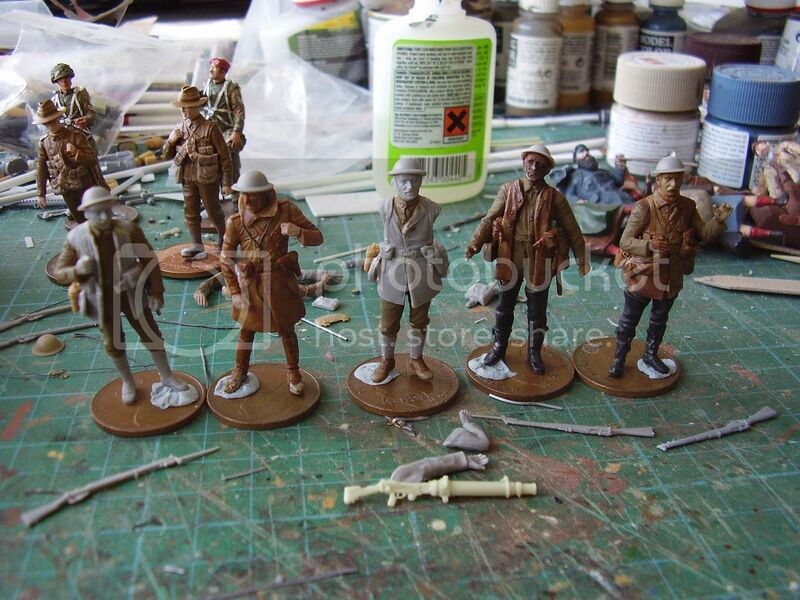 With the exception of water bottles each soldier appears to be kitted out correctly, although no back haversacks are included in the set. I’m not sure why they left out the water bottles but these can be added from other equipment sets if desired. 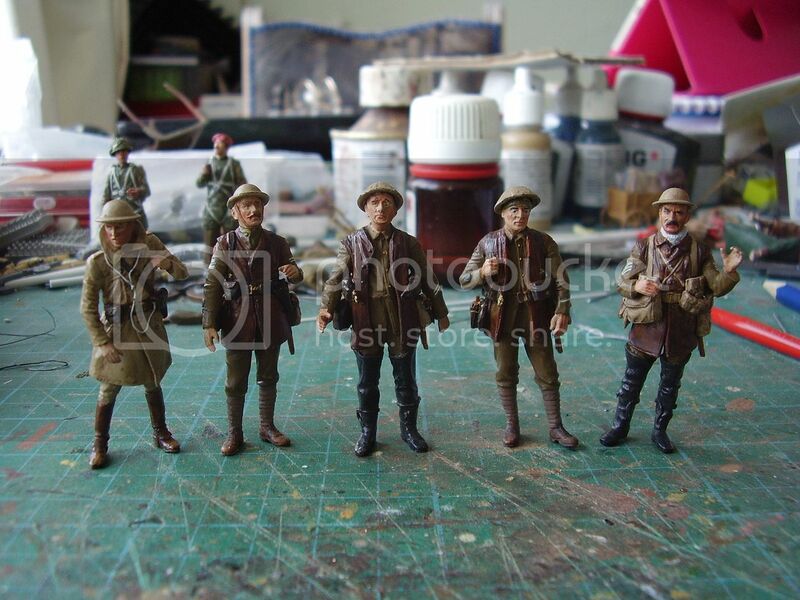 All the infantry are standing figures and two have their 1914 leather belts undone and their leather jackets open which is a nice touch. 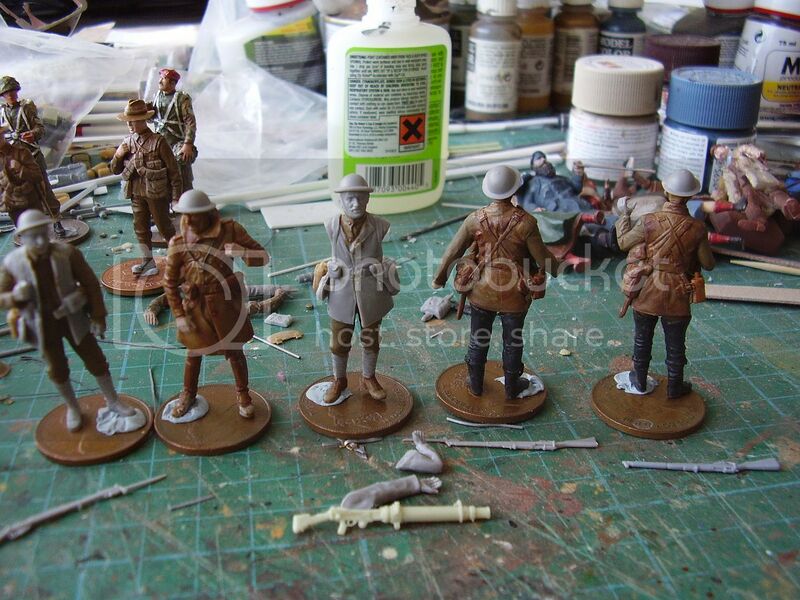 To add more varieties to the set, two of the figures wear no putties. I’m not sure if that was a good idea, given that both are wearing battle kit but the figures could be used in a group or as individuals depending on you need. 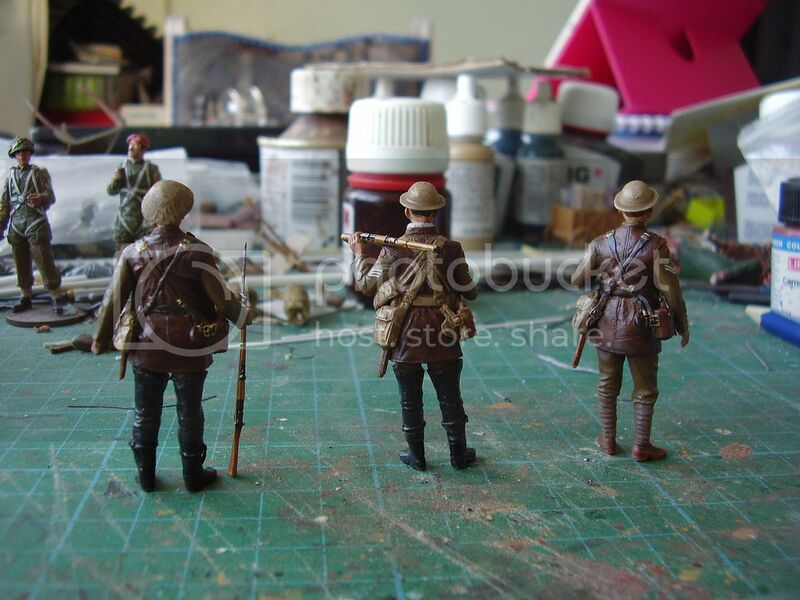 3 SMLE rifles are provided, two without bayonets attached and one with a Lewis gun that needs to be built up. Suitable holsters and ammo pouches are provided for the Officer and the Lewis Gunner. 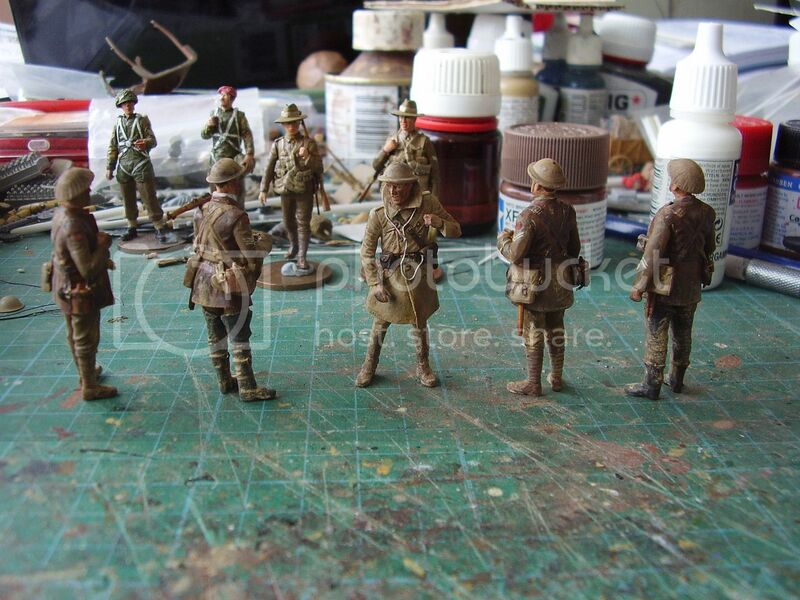 A very useable set of figures, of fairly good quality and detail. With a little TLC they should build and paint up well. There are seems on all the body parts that will need cleaned off, and the heads, although the faces are quite good, have poor ear and chin strap detail, that will need some work or replaced. Because of the missing putties on two of the figures and the mix of 1908/1914 equipment, I’m not sure that they blend that well, although mixes of equipment most probably occurred, and they could easily represent a group of soldiers from mixed units just returned from the front, but it would be unusual to see infantrymen without their putties on. I do like the effort of opening up the jackets and the unbuckled belts on two of the figures but I’m not that keen on the pointing officer and baffled by the missing water bottles. 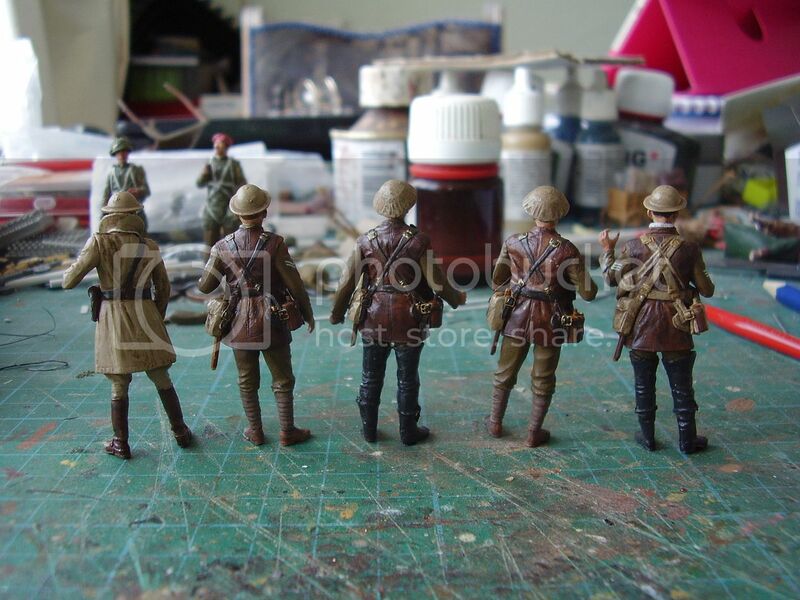 The poses are natural looking and with nice folds and creases in the uniforms they should make for decent figures when cleaned up and constructed. Master Box Ltd should be congratulated for providing another great choice for modellers. 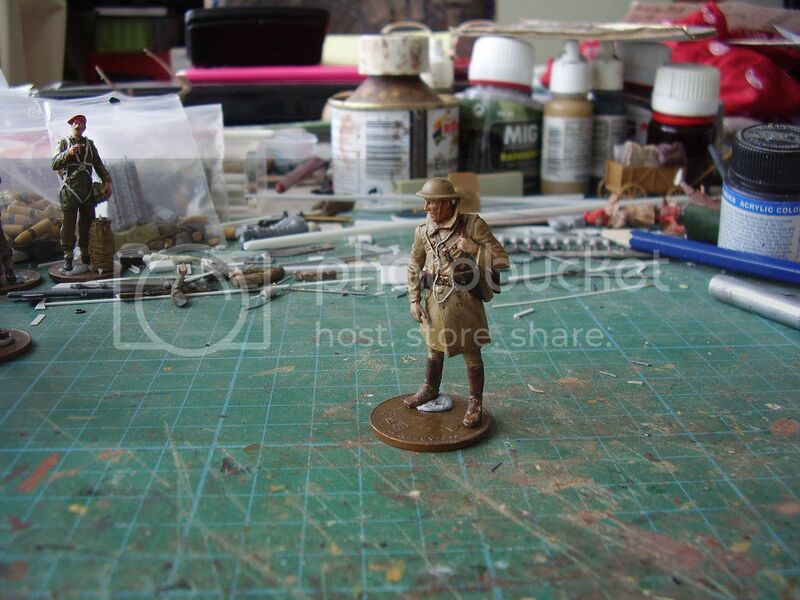 I've enclosed a couple of part build figure pictures. Highs: Good range of clothing wear. Lows: Poor ear and chin strap detail. I can't really see from the photos, but is it possible the two figures not wearing puttees are wearing waders? 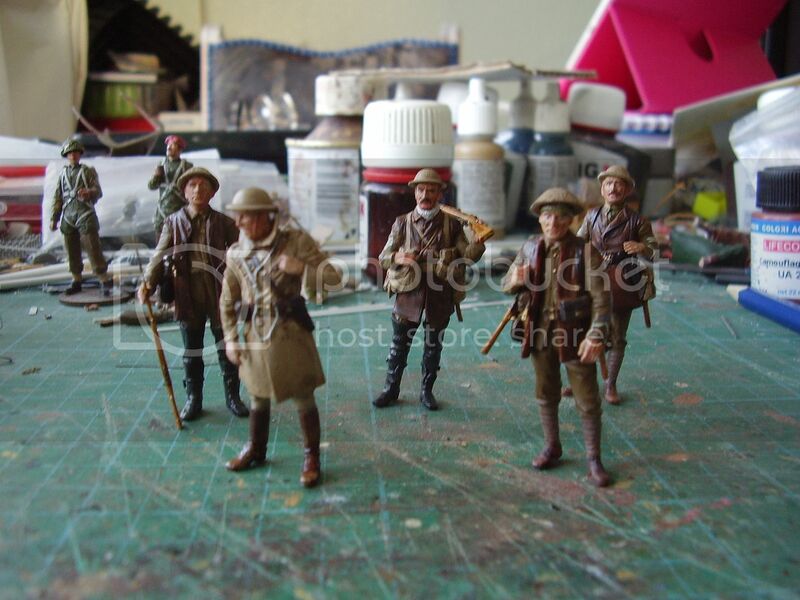 These are frequently seen in pictures of trench dwellers from mid-war on. The trousers look too full to be merely soldiers not wearing puttees, as without them, the trousers should be still tight to the calves a bit like riding breeches. 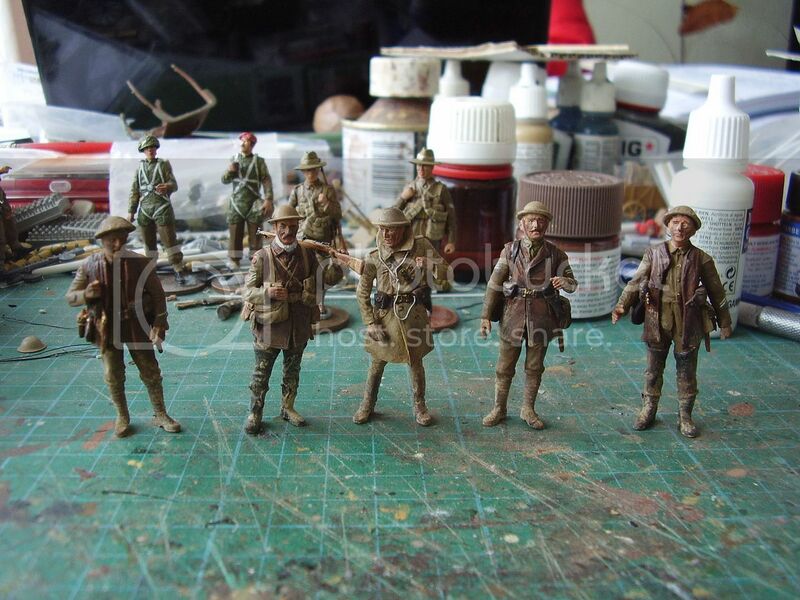 These figures have the look of soldiers returning behind the lines after a prolonged stint in the trenches, and this would make more sense?